14-time Grand Slam champion and Number 3 seed Rafael Nadal booked a spot in the final of the China Open, after beating Fabio Fognini of Italy in straight sets 7-5 6-3 in the semifinal on Saturday. The opening set saw the Spaniard break the Italian’s serve on three occasions and got 69% of his first serves in as compared to Fognini’s 62%. Nadal also won 19 first serve points as compared to 12 of his opponent and 52% of the overall points during the course of the set as compared to 48% of Fognini to win the set 7-5 and take a one-set lead. The second set both players hold serve in the opening five games, but the crucial turn arrived in the 5th game ,when Nadal broke Fognini’s serve to take a 4-2 lead and then won on his serve to take a 5-2 lead. but Fognini refused to throw in the towel so early, coming up with some breathtaking returns to stretch the match further. 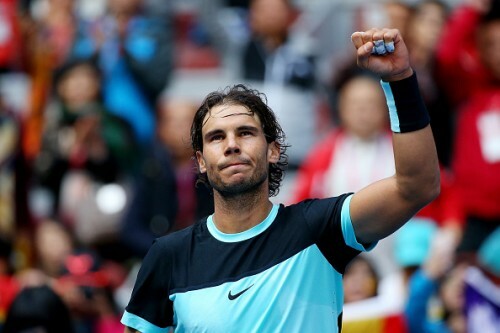 But despite his best attempts, Nadal clinched the tie in the ninth game to book a place in the finals. The set saw the Spaniard get 81% of his first serves in and win 56% of his points as compared Fognini’s 54% and 44% respectively. This was the Spaniard’s second win over the Italian in 2015. Nadal will face the winner of the second semifinal between Novak Djokovic and David Ferrer. Good match, Nadal d Fognini 75 63. Rafa really needed it & now another coming, likely vs. Djokovic, who has to d Ferrer. A real chance? Monte Carlo Masters 2019: Can Rafael Nadal reign supreme for the 12th time? When will we see the next Federer vs Nadal clash?